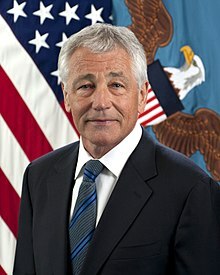 Chuck Hagel (/tʃʌk ˈheɪɡəl/ CHUK HAY-gəl; born October 4, 1946) was the 24th Secretary of Defense and the former U.S. Senator from Nebraska. He is a member of the United States Republican Party. He has criticized the Bush Administration on many things, such as the Iraq War. He was confirmed by the United States Senate on February 26, 2012 to become Secretary of Defense during Barack Obama's second term replacing Leon Panetta. On November 24, 2014, it was announced that Hagel would resign the position of Secretary of Defense due to job stress and decisions on ISIS/ISIL. ↑ Memoli, Michael A. (February 26, 2013). "Senate confirms Chuck Hagel as new Defense secretary". Los Angeles Times. Retrieved February 27, 2013. This page was last changed on 9 August 2018, at 20:27.